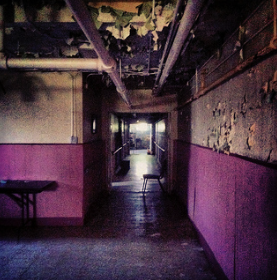 The Edinburgh Manor is arguably Iowa’s most active and haunted location. Set back on a lonely highway the manor overlooks a scenic countryside and is deserted… or is it? The cache is an easy park and grab from the highway, as the property is private (obtained owner’s permission). Find the cache and sign the log, it will keep your senses alert, as you may feel you’re being watched from the windows. Cache me if you can. NOTE: I had another overnight lockdown investigation at Edinburgh Manor, and so I can check up on the cache. Apparently someone got scared and bolted off with the inside container's cap making the log damp. I'm currently looking for a cap that fits instead of having to take down and re-do the entire cache. The cache still works and is there, however the log maybe damp. Thank you for your patience and visiting. This will be the cache's first full winter as well. So curious if the outside container's lid may freeze or be hard to open. Still worth a visit for the experience. There have been several new photos merging from this year of people taking pictures of the outside while getting uncanny images within the windows! 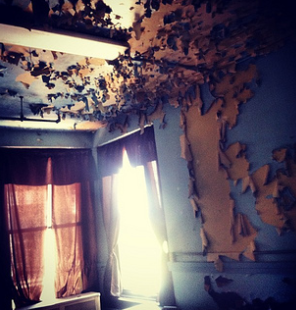 The Edinburgh Manor is arguably Iowa’s most active and haunted location. Set back on a lonely highway the manor overlooks a scenic countryside and is deserted… or is it? The cache is an easy park and grab from the highway, as the property is private (obtained owner’s permission) and can be booked for tours and private lock-down paranormal investigations. Find the cache and sign the log, it will keep your senses alert, as you may feel you’re being watched from the windows. Smile for a picture with the cache, make sure and review the photo, as you may see someone or something with you as many others have. Cache me if you can. NOTE: You can park off the highway for this location. PLEASE respect the private property. The cache is NOT located in or around the manor or surrounding buildings. It is a park and grab, typical easy find, please return exactly where found without getting spooked and running away with it. In 1910, the poor farm closed down and was demolished. Edinburgh Manor was then constructed from 1910-1911 to house the incurably insane, the poor and the elderly. 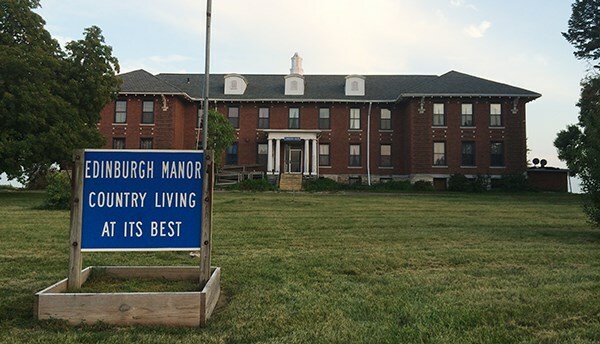 Edinburgh Manor, also referred to as The Manor, was in operation until November 2010. The Travel Channel's Ghost Adventurers team with Zak and crew was recently at Edinburgh for an investigation and will be the Season 11's Premier opening episode on Aug 22, 2015. —— In the season premiere, the team travels to Scotch Grove, Iowa to investigate the 150-year-old Edinburgh Manor. The manor once housed the incurably insane and has documented over 100 deaths within its walls. A menacing dark entity known as “The Joker” terrorizes those who enter, inflicting physical harm. Inexplicable technical issues plague the team from the start. As they make their way to the basement – the center of the Joker’s attacks – Bagans and Goodwin experience intense uncomfortable feelings, and Bagans decides to leave before the dangerous energy completely overwhelms him. But the investigation takes a frightening physical turn when Tolley makes contact with an active presence. 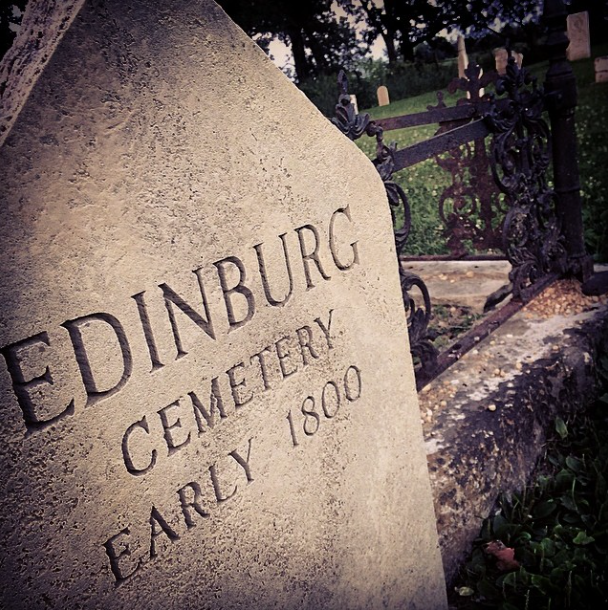 There is so much mystery to Edinburgh Manor and it is one of the most haunted locations in the state of Iowa. Sylvat uvtu gb gur tebhaq. Oyhr vf n pybfr pyhr.... OBB! Cemetery NearbySmall 1800s cemetery down the road. Edinburgh ManorFind the cache and sign the log, it will keep your senses alert, as you may feel you’re being watched from the windows. Smile for a picture with the cache, make sure and review the photo, as you may see someone or something with you as many others. 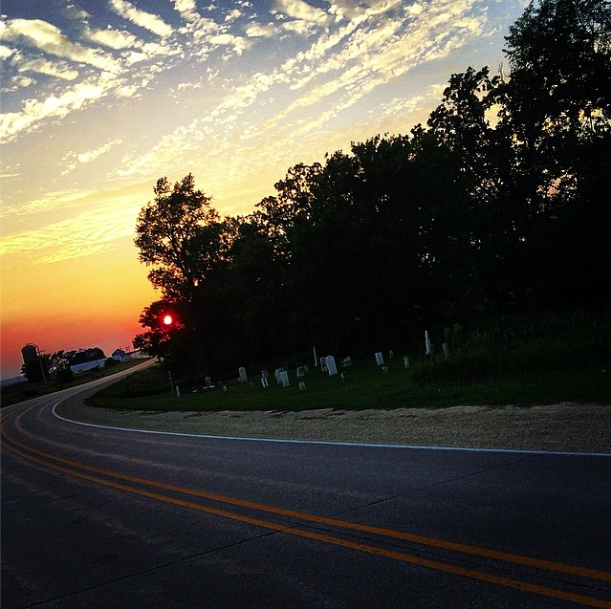 Life is a HighwayShot od the road at sunset that leads to the cache near the cemetery.